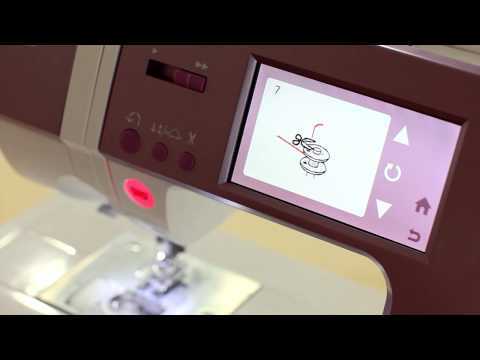 The Quantum Stylist Touch 9985 sewing machine takes sewing to a whole new level - starting with the easy-to-use color touch LCD screen, where you can view tutorials for setting up your machine to sew. Scroll through the 960 different stitches to get inspired for your next project. Your stitch selection appears in actual size on the LCD screen, and you can customize the length and width as well. Many stitches can be mirror imaged or elongated for even more creative options. Choose basic or stretch stitches for fashion sewing, quilting and heirloom stitches for quilts or table linens, or decorative stitches to embellish almost anything! Buttonholes can be sewn in one easy step, and there are 13 different styles to choose from – basic bartack, stretch buttonholes for stretch fabrics, keyhole buttonhole for menswear or outerwear, and more. Engage the Programmable Needle Up/Down to have your needle stop down in the fabric, which is great for applique, pivoting around a pocket corner or free-motion sewing. There is a Speed Control so that you can set the machine's maximum speed – slower for more intricate projects or faster for larger projects like curtains, duvet covers and more. No matter if you sew quilts or crafts, fashions or home decor, you'll never run out of ideas with the creative possibilities this model has to offer. One-Step Buttonhole (13)Buttonholes are sewn in one easy step. Just place the button in the buttonhole foot and the machine sews a buttonhole perfectly sized for that button, delivering consistent results every time. Thread Cutter Shut Off (+)Thread cutting function for embroidery mode can be turned off or on as desired, with the simple touch of a button. Tie-Off Button (+)Immediately tie-off the stitch and stop sewing automatically. You can even program the machine to perform the tie-off at the end of a stitch before you start to sew. High Speed Stitching (850/min)Professional speed for faster results.